Ammunition for God’s Soldiers strengthens, sympathizes, teaches and compels you to contemplate your thoughts or choices. In the form of poetry, there’s something in here literally for everyone so indulge yourself. 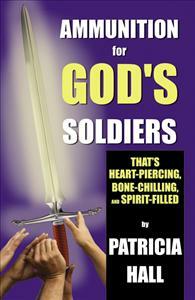 Ammunition for God’s Soldiers is written by a woman of God who has stripped herself and stands before you exposed, often saying to herself, “No, Pat, you can’t reveal that.” Oh, but she did. Tackling subjects that you don’t find addressed anywhere all under one cover. It compels you to contemplate some of the choices you’ve made in your life. This book will get under your skin, reach your soul, and wake up issues that have lye dormant under the carpet of your mind. It brings to the forefront issues of spirituality and your soul. Where will you spend your eternity? This book really addresses everyday life issues in a way that is inviting to the reader. The author compels you to continue reading because you see bits and parts of yourself and things that are true to life that people struggle with and go through. I thoroughy enjoyed this book and recommend it to others. I really enjoyed Ammunition for God's Soldiers, Every day, I devote a piece of my time to reading books of a spiritual nature. When I come across books I think that others may enjoy I review them. Always put God first in everything that you do, and He will give you so much favor. God is working it out for you. This book was very inspiring and a powerful read. I would recommend this book to anyone who is serious about growing in their relationship with God and man! This was a very inspirational book. I would reccomend this book to anyone,whether they are young or old. Overall this is a GREAT book!! Very involving. It draws you in and makes you remember how the Lords work can be so truthfull. The inspiration I received helped me to look forward and accept past events in my life as God's way of connecting me to the time it is now.....my future. Great book!